The mixed choir provides musical leadership during our liturgies. Our members have a love for enhancing the mass through music. You do not need to read music to be a member. Please contact our parish office for more information. Our Altar servers are students grade 4 and older and adults who would like to enrich their spiritual life by attending a training process to serve their God and learn responsibility and commitment to their Christian community. 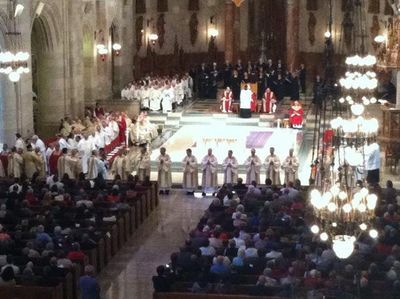 They have many roles, including procession before and after Mass. They assist with offertory gifts and other responsibilities that aid the priest and enhance the liturgy. The children's choir helps provide musical leadership during very special liturgies, including Christmas Eve, First Communion and Thanksgiving. no vocal audition is necessary- we raise our voices for God and the liturgy. Eucharistic MinistersA group of men and women who after preparation and commissioning distribute the Body and Blood of Christ during the celebration of Mass. Some of the Eucharistic ministers extend their ministry by taking communion to shut-ins, and those in the hospital and nursing homes. This committee's main focus is the care and concerns of others. This committee is involved in the Milan Food Bank and the annual giving tree at Christmas. The funeral choir helps provide musical leadership and support for song at the funeral liturgy. 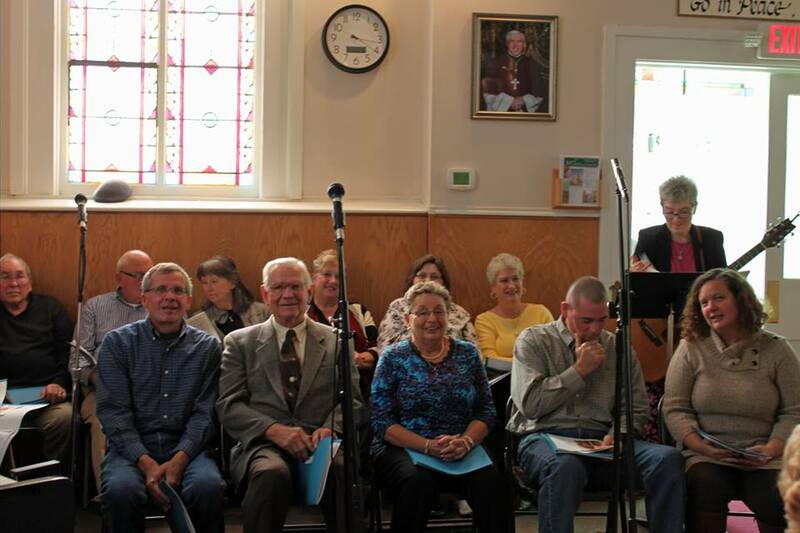 This choir is very dedicated to the needs of the family and strives to enhance the liturgy. Most funerals are weekdays at 10:30 a.m. There are no regularly scheduled practices. They meet immediately preceding the funeral Mass to practice. The bereavement committee comes together with the family at the time of death of a loved one to help plan and carry out the funeral liturgy. We share a book of appropriate readings and a list of music for the family to choose from. 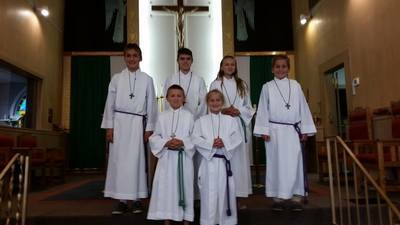 We provide Lectors, Readers, Eucharistic Ministers, and servers if needed. A funeral liturgy aid is printed with the readings and music selected by the family. This aid also has the prayers and responses of the mass for anyone that would not be familiar with the liturgy. We arrive early to the funeral liturgy to assist the family in their needs and offer support. They also provide a funeral lunch if desired. The health ministry is made up primarily of parishioners working in health care professions. Members join together to offer programs, provide information on wellness topics and health screenings to minister the physical, spiritual and emotional well being of fellow parishioners. Our health ministry team also provides free blood pressure checks the first Sunday of the month following the 8:00 a.m. Mass. A community-building day of food, games, and activities that supports our parish. The lectors have the primary role of proclaiming the Word of God in such a way that it comes to life in the hearts of the assembly. Those called to this ministry must have a loud, clear speaking voice and possess good speaking skills, speaking directly to the parishioners through the sacred scriptures. The liturgy committee members have many responsibilities. This committee collaborates on the seasonal planning for Sunday worship through the liturgical year, and also plans various sacramental celebrations and other prayer experiences, for example: Penance services, stations of the cross, Holy Hour, etc. This committee also provides ongoing formation for liturgical ministers and continues to be educated on the rites of the church. This committee is a major contributor to the seasonal decorations. This team helps advise on major decisions about repairs, large maintenance improvements, projects and preventative maintenance for our church and rectory. Monthly newsletter in the bulletin to inform parishioners about happenings at St. Anthony. The parish council plans for the spiritual growth and development of the parish. A group of people who serve by praying for people in need of prayer during time of illness, injury, or other difficulties in their lives. Prayer requests can be put on our chain by calling Linda Salmons- (419) 499-4584. Shawls and lap warmers are hand made with love and prayers. These gifts are given to individuals in need of spiritual strength and healing during times of illness or unexpected trials. No meetings, work at your own pace, no age limit, men and women welcome. Step out in faith and become the hands of the Holy Spirit in action and make shawl or call in faith and become the hands of the Holy Spirit in action and make a shawl or call with the name of the person in need. 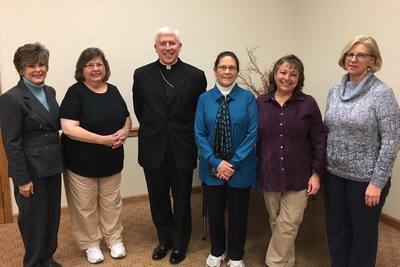 This ministry team assists the priest by preparing the church and sacristy for daily and weekend Masses. They see to it that the gifts are ready, lights and microphones are on, and other necessary tasks are completed so that the priest celebrating Mass has more time to focus on his preparations. Families earn credit by ordering gift certificates or shopping at local grocery stores. Credit earned are applied yearly to students' tuition, assistance for needy families, or support general parish operations for St. Anthony's, St. Mary's, and St. Paul's parish. Our ushers have the role of creating and atmosphere of hospitality & welcoming parishioners and visitors as they arrive for Mass. They arrange items that need to be readied for Mass, reserve pews, help people find seats when needed and take up the collection. They pass out materials to parishioners as needed and select families to carry up the gifts during the offertory. The welcoming committee meets and greets new parishioners on a personal level.